Last week’s toxins have seeped into my cells and it’s time bloodwork and possible damage control. This involves a transfusion to replace anything that is dangerously lacking—i.e. white blood cells; red blood cells; platelets… hair implants, anyone? I started to feel better, but I’m not sure if I’ve been through the worst. We’ll see. Now that I think about it, the worst is getting up for a 7:30 a.m. appointment. What are they thinking!? I’m supposed to have an unstressed life and they put early morn appointment times in my calendar! So I called the previous day and begged for a later time. I got a callback from the scheduler stating that “Nothing is available, but if you get there late, what can they do.” That statement was followed by a, “Don’t tell anyone I told you that.” I still managed to get there at 8 a.m. When the numbers came back, everything was A-OK! 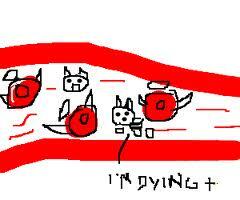 No transfusion. My cells are all playing nicely in perfect harmony and so unlike the videos looping on every news channel. Cool. Scott and I came home and later went to a soiree held by a colleague of Scott’s. The man’s printing company was celebrating their 40th anniversary. We got a tour of the presses and watched the Pioneer Press photographer grab his photo op with the Mayor. There was a band, food and lots of giant plastic blow-up things. 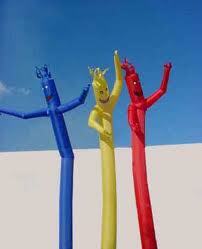 One of those was the 20-foot hollow Gumby-like guy whose flailing arms and body keep him dancin’ in the street. You’ve seen him. I love those guys. They’re so free and full of energy. How can there be any discord with one of those guys around??? Needless to say, even though the sky threatened rain, the event was very relaxing and peaceful. I figured the afternoon festivities might put me under for the day, but I was wrong. In my “back pocket” was an email with details to an event at The Poetry Foundation. 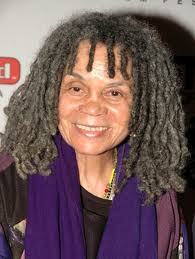 The organization was featuring Sonia Sanchez, an incredible poet to truly understands the value of reading out loud. I was determined to go if I felt up to it. The poet’s father was a musician and Sonia grew up in Harlem. Each poem rolled off her lips like a jazz lyrics. She wrapped the audience with love and they felt it. She spoke of overcoming war by figuring out how to make it less profitable than peace. She gave away a book to a young woman who’d stood in line, to tell her how much she admired her work, but couldn’t afford to buy her book. She said we are all taught that justice is fighting back when it’s really about elevating the “enemy” to our level—not reducing ourselves to theirs. And when that seems difficult, we need to evolve. Plus, you gotta love a 78-year old woman with dreadlocks. At the end of the day, peace had settled in every cell of my being. You do the coolest things ! Thanks for putting a link to Sonia Sanchez’s website – very cool lady! I feel peaceful just reading your story – the poetry event sounds wonderful, and you sound wonderful!